Plastic bag recycling is more complicated than you might think. Just because the bags are made of plastic doesn’t mean they can be thrown into the recycling bin with all the other forms of plastic. Plastic bags and plastic film are different from other forms of plastic. Because the material so flexible, the plastic can wrap around the shafts and other equipment that parts of the sorting process. This can disrupt the flow and direct materials into groups in which they do not belong. Now the plastic bags have to be sorted by hand. This slows down the system. Occasionally, the separation process must be halted to shut down the automated system entirely. Workers must then engage the lines of refuse with box cutters to extricate the plastic bags from the other materials, rollers, screens and other machinery parts. These additional steps make injury to the workers more likely. It’s estimated that 30% of the work in sorting recyclable materials is removing plastic bags and film from the automate sorting process. Over time, this ends up costing consumers and local governments more money. When it comes to plastic bag recycling, it’s possible for consumers to become a solution rather than a source of complicating the process. It’s important to understand that simply because a product or material has a plastic number code does not mean that it is automatically recyclable. Each community is different, so it’s important to check with your neighborhood trash haulers or local government to see which materials are appropriate for recycling in your area. More and more plastic bags are becoming biodegradable. In the meantime, the best solution is to return the bags to your local supermarkets. Most have special bins for plastic bag recycling. 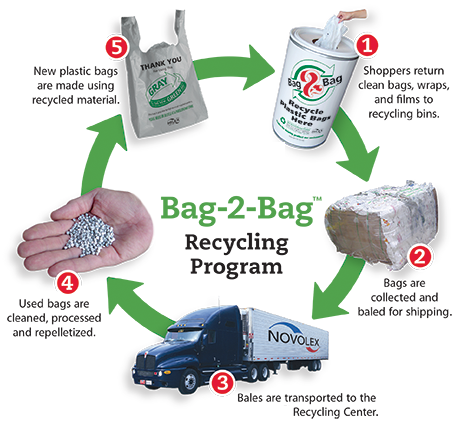 These returned bags can be thoroughly cleaned and washed and be made available for reuse. Find local drop-off location for your plastic bags.